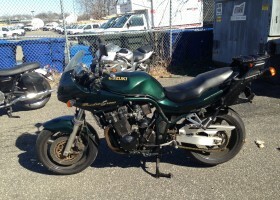 1999 Suzuki Bandit 1200 SOLD! Scooter service is scheduled by appointment on weekdays only. Modern Classics is a full-service scooter shop located in Washington, DC. We carry new Genuine scooters including the unbeatable Buddy 125 and 170i, the new Stella 4-Stroke, and a varied selection of used and consignment scooters and motorcycles. We also feature riding gear from Rev’It!, AGV, Alpinestars, Icon, Z1R, and GoGo Gear. Modern Classics services a wide variety of vintage and modern scooters.